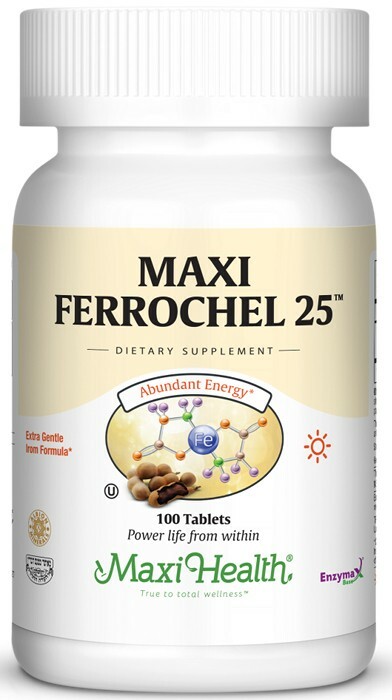 Maxi Ferrochel 25™ is the right iron for you! Ferrochel® is a patented, nutritionally functional amino acid chelate form of iron. Human clinical studies have shown it to be an iron of great bioavailability and tolerance (easy on the system). Menstruating and pregnant women, athletes, and vegetarians may all have difficulty getting adequate iron supplies from their food. When you reach for iron, chose the gentle one. Try Maxi 25™ - the gentle iron supplement. *Clinical studies have shown that Ferrochel® improves hemoglobin and ferritin indices at lower dosages than other forms of Iron. Eight months ago I became a new mother. After a few weeks I started to suffer with fatigue and listlessness. Upon the recommendation of my doctor, I resumed taking Maxi Ferrochel 25 Iron formula which I had stopped taking after the baby was born. The anemia, which I suffered from, was cured and my energy restored. I am one happy mother now. Thank you Maxi Health! I was very low in Iron & after a week of taking the Maxi Ferrochel my Iron levels went up a full point. My doctor was very satisfied with the results.